Uzbek government Vice President – Rustam Azimov: successor or scape goat? It seems that nobody actually believes that free and fair elections will ever take place in Central Asia. On the other hand, it is still totally unclear, how the power change will happen in some of the authoritarian countries. Will Nazarbayev, Karimov and Rahmon, who have been ruling for twenty and more years, rule until their last days, like Niyazov-Turkmenbashi? Or will they prefer to choose a handover mechanism of their privatized post to a trusted person while they are still living, like the Yeltsin-Putin scenario of 1999? We are launching a series of publications dedicated to this topic and inviting academics, experts and politicians to also express their opinions on the pages of our publication. The first article is dedicated to the portrait of one of the more likely heirs of Uzbekistan’s president. Only six months ago, rumours surfaced that Islam Karimov has not only made, but also announced his choice: in the circle of trusted people he allegedly announced that Rustam Azimov will “reign” after him. It has not yet been possible to confirm or deny this. However, it is interesting: are there any real foundations to view Azimov as the future Uzbek president? How strong is his influence today? What are his real or imaginary achievements for the country? Does he deserve to occupy the highest post in the government in future? 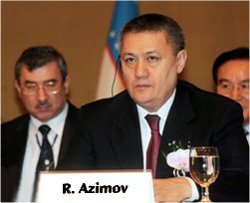 The first deputy of the prime minister of Uzbekistan, minister of finance, head of macroeconomic development, structural economic development and comprehensive development of the territories Rustam Sodikovich Azimov has survived in the top echelons of power for a long time and is doubtless one of the key figures of the Uzbek establishment. He has worked in the country’s government for almost fifteen years and in the top financial sphere since 1991, as the chairman of the National Bank of International Trade and simultaneously the head of the European Bank of Reconstruction and Development from Uzbekistan. Moreover, it is likely that this model is viewed as being quite successful in Tashkent. This is probably why a series of articles of the Uzbek Constitution were changed, and the republic’s government gained more real, rather than simply nominal, rights. However, the expansion of the government’s powers did not lead to the economic situation in Uzbekistan getting better, but quite the opposite – it got worse, and this does not take account of the fact that rival factions arose within the government, and some of its meetings started to resemble arguments, rather than constructive work. The increasing energy crisis, high growth in prices for vital food products, steep fall in exports – all these are fruit of the government’s activities and, primarily, its economic block, for which Vice-Premier Rustam Azimov bears personal responsibility. Moreover, in recent times, in order to conduct these economic policies, representatives of the economic block started to engage in almost open falsification of indicators, for example when it comes to price growth, inflation, and unemployment. Here is just one example: when the price of diesel became 7.5 million per tonne, the newsticker on the Uzbek borse was 2.5 soms per tonne (!). Diesel prices grew by 2.6 times in the last two years. The cost of natural gas for industrial enterprises grew by 25% throughout the year, there was significant growth in petrol and building material prices. According to numerous indicators inflation is over 22% in Uzbekistan, when the government states that it is not more than 9%. Corruption, after the aforementioned changes to the constitution, has become limitless, and is reminiscent of Soviet times, but the effectiveness of government interference is almost equal to zero. It is completely incomprehensible for whom these myths about economic successes are created. Almost all structural economic reforms have been halted in Uzbekistan, the stock market is not developed, privatization and several other important reforms have been stopped, trade infrastructure is being destroyed. The latest government “innovations” in the small business tax regime have led to the mass closure of small businesses. Pressure on trading centers and limits on their activities have led to the fall in trading activity and profits. Local authorities are getting increasingly involved in the activities of economic entities. What kind of president can this person become, if in recent years his activities have been dedicated to burying the economy of his own country? The question is a rhetorical one. Because, it is unlikely that he, who names him as his heir, will care about the nation’s wellbeing. More likely, he will be more concerned about his family and its capital remaining untouchable. People say that Rustam Azimov, the country’s head economist, is also the Family’s wallet, who serves the personal financial interests of the president Karimov’s entourage. However, this theory has only indirect confirmation. For example, Azimov personally controls the Republic Fund of Reconstruction and Development, the size of which, according to the Vice Premier, was $11 billion in August 2012. It is this very Fund that is filled with the excess profits from selling strategic raw materials – uranium, cotton and gas. A series of pompous structures, like the Forum Palace, President’s residence and Bunyodkor stadium, was built using money from this fund. However, Uzbekistan has still not paid the bills of some of the contractors involved in some of these projects. It is likely that one of the managers of the project simply did not want to part with the money. Or, perhaps large sums went in another direction. Unfortunately, such “development funds” and “strategic savings” are not accountable to ordinary people not only in Uzbekistan, but in many post-Soviet countries. So, to find out how and where this money goes, is still impossible. Some Uzbek opposition figures living abroad say that Rustam Azimov works closely with Gulnara Karimova – he helps her funnel money into foreign banks and carry out international deals. However, his name has not been named in any of these cases officially: the president’s daughter prefers to use little known dummy figures like Gayane Avakyan, who is now at the centre of the scandal surrounding the Swedish-Finnish telecommunications giant TeliaSonera. However, it is very unlikely that the Uzbek princess, who holds her hand on the pulse of the most profitable parts of this country’s economy, manages her business without such an expert. Who will be on the edge? An impression is molding that sooner or later, the Uzbek government, which is guilty of destroying the economy, may be held to account. However, any dictatorship likes playing with democracy, which is why everything must be presented in the best possible light. only when “the deciding individual,” i.e. the country’s president, desires this. The question is only who exactly the president will decide to sideline – the head of the government or his deputy, who is leading the financial-economic block? The answer to this question will show Rustam Azimov’s future chances of being president. However, it seems that the current head of the Uzbek government continues to favour Azmimov. Only yesterday, Islam Karimov signed a decree to create a special Republic committee to optimize the structure and reduce the number of management personnel in government and commercial management bodies. Deputy Prime Minister Rustam Azimov is to head this commission. Uzbek media report that this commission will “critically analyze” the existing managing functions of government and commercial management bodies, and will make suggestions to optimize the structure and reduce the number of management personnel in government and commercial management bodies by 10 -15%. It is unlikely that any positions will actually be cut. Yet Rustam Azimov will be able to strengthen his position by promoting his supporters. So, if Rustam Azimov’s influence is not being strengthened, it is not declining.